Not only are residents leaving out individual pieces of garbage, they’re putting the waste removal employees in harm’s way by leaving the trash for them to sift through. In addition to the germs carried by the city rats that skitter up and down the sidewalk after dark, environmental website Grist.com states that the bags of cat feces can transfer a disease called toxoplasmosis, which is especially harmful to infants and adults with low immune systems. 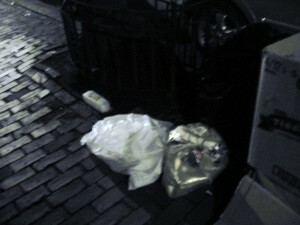 The garbage has also proven to be a hazard to walkers in the area. Merin continues “Joy street is a very high-traffic area, and I’ve definitely seem some people slip on trash that has been left out.” The key cause of the area used to be attempting to get residents to recycle properly, and lately it’s become a desperate attempt to simply throw the garbage away. In a neighborhood where many residents must ask permission to place air conditioners in their windows in order to preserve the aesthetic of their building, some residents appear to be completely indifferent about the fact that they’re causing a rat infestation with their inability to dispose of waste properly. A contributing writer for DirectoryofBoston.com, Megan Johnson is originally from Connecticut but has lived in Boston since age 18. She frequently writes for MenuPages Boston, Butterfly Diary, Reinventing Beauty Magazine, and SweetTalk on the Spot. You can visit her website at www.meganjohnson.tumblr.com.